The structure of the film is an absorbing series of reveals by director Tim Wardle, with each new revelation so exceptional it serves to negate the story up to that point. It also has some uncomfortable examinations of identical triplets and twins who are separated, where in a sense they are the same because of DNA, but also have differences that are due to being raised in different families. There is also some sleight of hand in this part of the debate, as the filmmaker takes the us down one path, only to make us realize we never should have considered it. And while this film is well done and comprehensive overall, it still lacks some fundamental answers regarding the triplets and the whole truth behind their adoptions. Truth, unlike fiction, is always much messier. In the State of New York in 1980, a new freshman arrives at a small upstate community college. When he gets there people already recognize him, in a type of Twilight Zone weirdness. A classmate intervenes and tells the newbie that he has an identical twin that had previously attended the school, and convinces the kid to call him. They have a reunion that is picked up in the media… David Gellman and Bobby Shafran are together again for the first time since birth. But the story doesn’t end there. 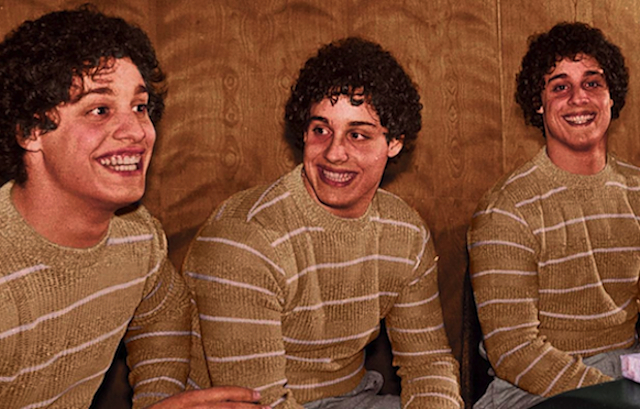 Another teen, Eddy Galland, sees the news stories about the pair, and realizes that he looks identical to them. He then calls them, and they all come to the conclusion they were placed in families from the same adoption agency. They immediately become media darlings, as their similarities are celebrated, and they eventually run a restaurant together. But there other truths yet to be revealed, and leads to some darker ramifications. What is fascinating about the triplets is that the 1980s media existed to record their initial meet up, and then as older men they’ve gained a perspective on what happened to them. The portrait is of men with regrets, not about the reunion, but about the way everything was handled. The Wiseman agency in New York City was famous for placing children from unexpected pregnancies – the triplets’ mother had them as a result of a one night stand in high school – and pairing them with Jewish families. What the separated boys didn’t know was that the agency allowed a psychologist to observe the children after they were placed, for many years afterward. This social engineering was only part of the shock… all of this was done under the cooperation of adults, which made the adopted kids pawns. The film does an amazing job of breaking down this humiliation, and watches as it weighs heavily on the triplets. And while on the surface it seemed to be a feel good story, it ended up more sinister, calling into question how our genetic connections can be altered by the psychological state of our upbringing. There are another pair of identical twin women featured who also found each other, similarly to the triplets. They are used as both a proof of initial uniformity in sharing like DNA, but they also have a breakdown once they go beyond the equivalences. The whole film becomes about secrets, but once the shock value of the secrets die down it becomes about family… that unpredictable and disconnected harbinger of our eventual being. There are many unanswered questions by the end of the film, and the biological mother of the triplets is given merely a sentence in the overall novel of the development. But what happened to the boys and girls of separation becomes representative of the social structures that bind us, and how much those families bless and curse our lives, often at the same time.